Dr Sketchy’s Melbourne is celebrating 2 years of pastie infused life drawing with 2 models AND 2 sessions! Miss Peachy Keen and the amazing Roller Girl aka Miss Sugar Lee. 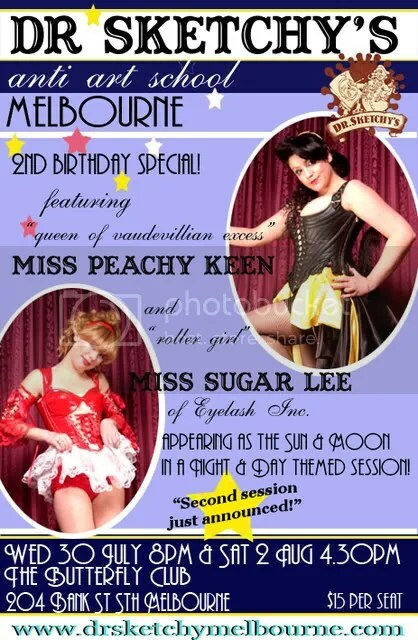 Along with the usual sketchy fun, Miss Peachy Keen will be performing songs from her Fringe Festival hit ‘Miss Peachy Keen and her bevy of delectable ladies” with accompanist, Andy Volmer on piano and Miss Sugar Lee will delight us with her routine in full gold body paint!